The landscape of Hong Kong is characterized by its beautiful harbor ﬂanked by more and more grand skyscrapers squeezing out the waters on the Hong Kong Island and Kowloon peninsula shores. It is an image of a modern metropolis of glass, steel and concrete concerned with only with commerce and ﬁnance. This image is certainly true and is what most visitors to Hong Kong experience but to the people of Hong Kong there is much more to their city. In fact about 70% of Hong Kong’s land is open space and the city is surrounded by the open waters of the South China Sea and the Pearl River Delta. It is a place that has been inhabited for at least 2000 years and has an uninterrupted lineage to the ancient culture and arts of China. Due to its recent colonial period as a vassal of Great Britain a special culture has established that contrasts Hong Kong from the surrounding Chinese regions. It is from this milieu that Hong Kong artist and architect Raymond Fung has drawn his inspiration for his china in China series. Now retired after a long career as a noted architect working for the Hong Kong Government, Raymond now pursues his ﬁne art practice full time while also serving on an array of advisory committees that concern the development of art and art related venues in Hong Kong. Raymond’s philosophy in architecture is that less is more and this approach is mirrored in his ﬁne art painting practice. He has mastered the vital skill of dealing with space, as is evident in his paintings with carefully composed ink or color blocks that emphasize the contrasts of solid and void. 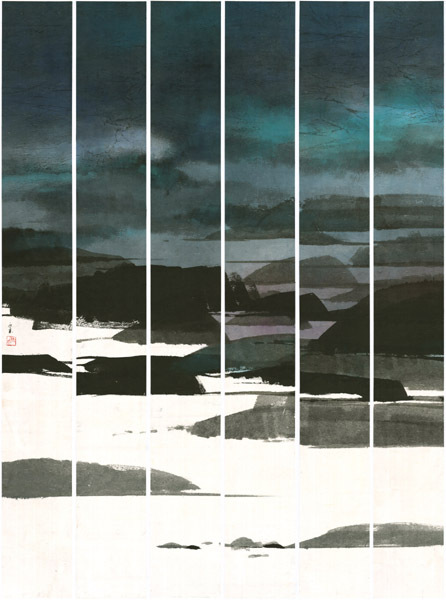 Fung draws inspiration from the ancient masters of Chinese brush painting but also acknowledges the influence of the 1960’s New Ink Painting Movement in Hong Kong led by Lu Shoukun (1919-1975). 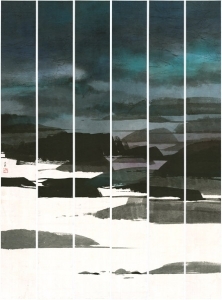 Using traditional materials and techniques in his compositions and channeling ancient aesthetics such as the blue green landscapes of the Song dynasty, Raymond’s modern atmospheric compositions bridge the variety and sometimes disparate elements of Hong Kong’s unique culture. He has stated that his paintings are inspired by the deserted areas such as the city’s surrounding islands and the open spaces of Sai Kung and Plover’s Cove. His minimalistic approach to his compositions expose the essence, essentials and identity of his subjects through eliminating all non-essential forms, features and concepts. Fung’s paintings are a delight to the eye exercising our viewpoint and encouraging movement through his compositions while offering relaxation with his choice of colors and ink tone. 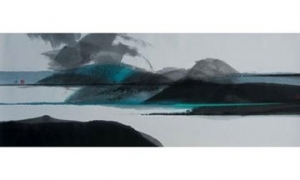 Raymond Fung now represents the leading edge of New Ink Painting Movement in 21st century Hong Kong. I want to thank Raymond Fung for the beautiful work that he continues to produce and for the long relationship he has maintained with Plum Blossoms Gallery. It is an honor to work with such a dedicated artist. I also would like to acknowledge the ﬁne work of my staff at Plum Blossoms who have done a beautiful job in mounting the china in China exhibition. Khadinn Khan has acted as Project Coordinator and has provided the translations in this exhibition catalogue. Monica Fu has done a great job with the catalogue design. I thank them for their exceptional contributions. china in China is a unique showcase of recent paintings by Raymond Fung, a true Hong Kong living treasure. I invite all of our friends and clients to enjoy the beauty of Raymond Fung’s art.